Back in the day, the side by side was the premium looking refrigerator and then the French door became the new upscale refrigerator. About two years ago the double drawer French door became the new desirable product. Unfortunately as Brett (the author) discovered, there are only three of these available as counter depth. 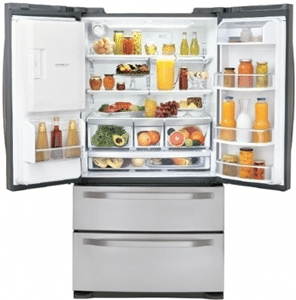 So you love the new double drawer french door refrigerators flooding the market. One problem, you can't have a refrigerator protruding 14 inches in your kitchen. While the large capacity is one of the attractive features, most people can’t fit one of these beasts. With Boston being our primary market, we see a lot of galley kitchens in the city and kitchens in houses built 100 years ago. Only a few manufacturers have addressed this issue and are now offering this design in the counter depth (shallow depth) option. Below are some of the current offerings on the market. Humidity Controlled Crisper - Designed to help keep your fruits and vegetables fresh and crisp. You can control the amount of humidity in the crisper by adjusting the setting between High and Low. Glide N' Serve - Provides storage space with a variable temperature control that keeps the compartment colder than the refrigerator. 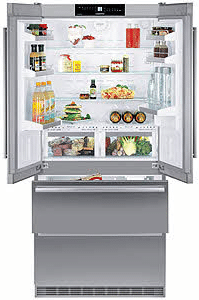 Auto Closing Hinge - The refrigerator doors and freezer drawers close automatically with a slight push. Ice Plus - Ice production can be increased by approximately 20 percent when the freezer section is maintained at the coldest temperature for a 24-hour period. Electronic controls, multiple electronic sensors and a multi-flow air system help provide even cooling. Freshness Center with Full Width Drawer - Keeps fresh tastes with two humidity-controlled crispers and a full-width drawer. Drop-Down Shelf - Hide-away shelf provides additional space for a variety of items when you need it and tucks away when you don't. Multi-Level Slide 'n Store System in freezer - easier access to frozen foods with a plastic bin and wire baskets. BioFresh- fruit and vegetables, meat, fish and dairy products all retain their vitamin content, delicate flavor and appearance for up to three times longer than in a conventional refrigerator compartment. SuperCool- lowers the refrigerator temperature down to as far as +2 °C for as long as 12 hours - ideal for rapidly cooling freshly stored food. SuperFrost- It quickly reduces the temperature to -32 °C and creates the cold air required to preserve vital vitamins. Of the three listed above, the Liebherr is my personal favorite. It is significantly pricier but the benefit of the dual compressor system makes up for it, especially if you eat a lot of fresh food. 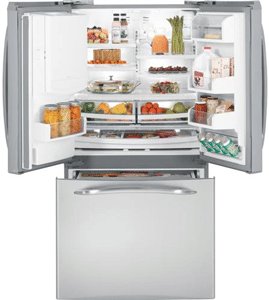 Regular refrigerators draw their cold air from the freezer which is very dry. This is what causes your greens to wilt after a couple days. The moist air ends up in your refrigerator. On average you save about $500 a year on food with this system because of proper circulation. Download the Yale Counter Depth Refrigerator Buyers Guide with features, specs and tips to buying the right counter depth refrigerator. Well over 25,000 people have read a Yale Guide.